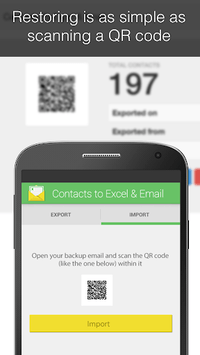 C2X (Contacts Backup--Excel & Email) is the easiest and most reliable tool to backup your contacts. It reads every single detail of all of your contacts, converts them into a Microsoft Excel file and emails the file to you. * Export all your contacts with a single tap. * Get all your contacts straight into your mailbox. 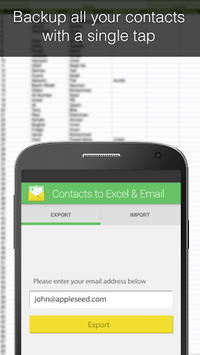 * Contacts are emailed in Excel format which is easy to read. * Restoring is as simple as scanning a QR code (Paid). Contacts Backup, Contacts Restore, Contacts to Excel, Contacts to Email, Contacts Export, Contacts Import, Contacts to Excel and Email.